Harrods Crossing Homes for Sale | Crestwood, Kentucky | Harrods Crossing Real Estate | Louisville MLS | Joe Hayden Realtor - Your Real Estate Expert! 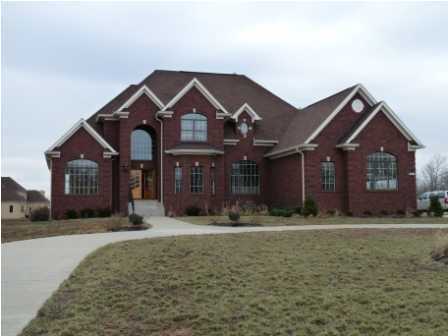 View all Harrods Crossing Homes for Sale on the Louisville MLS listings below! Harrods Crossing real estate is located off of Highway 329 and Interstate 71 near Crestwood, Kentucky. The subdivision of Harrods Crossing is an upscale neighborhood that features spacious lots, custom-built homes, and a relaxing, peaceful feel that draws in residents from the surrounding areas. Homes in Harrods Crossing cater to home buyers who desire upgraded finishes, large, open floor plans, plus plenty of storage space available for cars, trucks, boats, and lawn equipment. Without a doubt, the subdivision of Harrods Crossing is a great place to call home! Homes for sale in Harrods Crossing are typically priced from $450,000 to over $900,000. Most of the homes in Harrods Crossing are constructed of fine brick and stone materials, plus you may find Hardie board siding and stucco depending on the home. Because the homes are custom-built, there is a wide-variety of styles of homes available in the subdivision, though most homes are modern, two-story homes with two or three-car attached garages. In addition, most of the homes have basements that are at least partially finished providing home owners with extra space for media rooms, entertaining, and extra bedrooms. Harrods Crossing is near Crestwood, Kentucky and is located in Oldham County. As such, the neighborhood is close to the south campus of the award-winning Oldham County School System giving residents excellent choices for education. With its convenient location to Crestwood, Harrods Crossing residents are able to access grocery shopping, local entertainment, a drug store, plus several fast food and sit down restaurants. In addition, residents living in Harrods Crossing enjoy easy access to Interstate 71 and Downtown Louisville. If you are considering buying a home, you should give consideration to buying a home for sale in Harrods Crossing. You can search for your new Harrods Crossing home on the Louisville MLS listings below.